It's the middle of July, I've watered my lawn once this season and haven't used any chemical fertilizers or pesticides and have the nicest lawn on the block. What's the secret you ask? There isn't one secret, it's a combination of doing a lot of little things correctly. To steal someone's line, I'm not showing you these pictures to impress you, but to impress upon you how easy it can be to have a nice looking lawn without using chemcials. I'm not sure that having a nice lawn is that impressive anyway, but it shouldn't be difficult to achieve if that's what you'd like to do. Here's one of my neighbors lawns that is mowed way to short and has allowed crabgrass and other weeds to get established. Here's the divider between my neighbors lawn and my lawn - the left side is the neighbors lawn. You can see in the picture below how my lawn looks nice and healthy and green compared to the neighbors and others on the street. 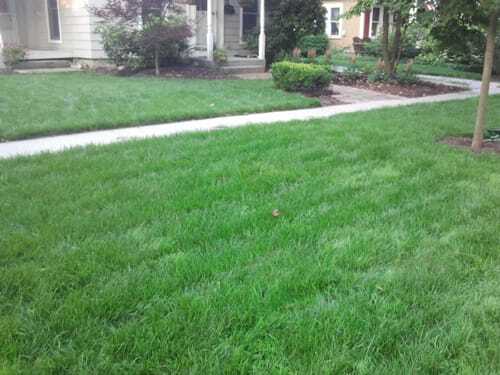 How do you have a nice looking organic lawn like this without constant chemical applications? An organic lawn that you'll be proud of both because it doesn't use chemicals and also because it looks nice and adds value to your home? Read on to learn the simple things I do to keep a nice looking lawn. This sounds like a bit of a cop out, but it's really true. Some lawns, especially older lawns are made up of grasses that can't compete well with weeds. I made a lot of changes to my landscape a few years ago and replanted the lawn with Good Nature Tuff Turf - a grass seed mix that contains a high amount of Turf Type Tall Fescue which is more drought tolerant and insect resistant than most grasses used in Ohio. 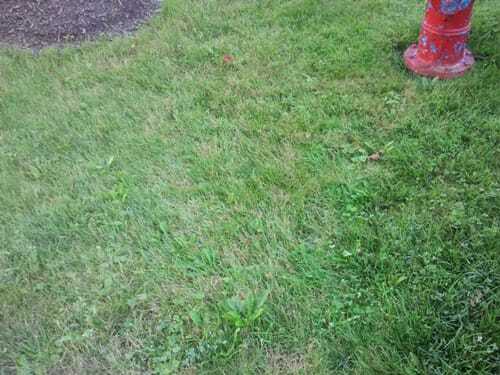 Turf Type Tall Fescue looks greener with less water than most other grass types. If you're lawn isn't in good shape, renovating it and starting from scratch in August or September is the way to go. Read here for more information and pictures of different grass types. Late Summer is the best time to replace your lawn's current grasses with better performing heat resistant grasses that fight weeds and insects better than you're current grasses. 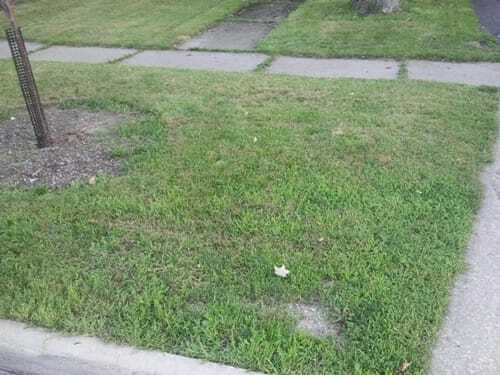 Click Here for more information about replacing your lawn. I mow the lawn at least once a week on just about the mowers highest setting. The front lawn has been established for a little longer than the back lawn and grows faster, so I mow the front lawn a little taller than the back to keep from ever removing too much of the grass blade in any one cutting. If the lawn gets really high, I mow on the highest setting (about 6 inches high) one day and come back a couple days later and mow it down to 4.5 inches. The key is to never remove too much of the blade at one time. If you ever have clippings that need to be raked, you just put your lawn into a state of shock and invited weeds to grow in it. You should never need to rake or bag your clippings. Mowing high also helps shade the soil to prevent annual weeds (like crabgrass) from germinating. In fact, University studies have shown that mowing high prevents as much crabgrass as any pre-emergent lawn chemical does. So, I mow high. Click Here for More Information & Videos on Mowing. I seed a little bit every spring and fall. In the spring I mostly seed bare spots and lightly rake the lawn to help it recover from snow mold. In the late summer (august), I love to slice seed my lawn. This injects new seed into the soil and keeps my lawn young and healthy. The more seed I put down, the thicker the lawn is and the more difficult it is for weeds to get started. I am a Good Nature client and I use all 7 regular applications to keep the grass healthy, plus an extra natural weed buster in the spring and 2 extra natural weed busters in the fall. This really helps keep the weeds to a minimum. In addition, I like doing a spring and fall liquid aeration to gradually improve the soil. In the backyard where it was really compacted when they built my garage, I do a little extra liquid aeration by purchasing Aerify Plus and applying it myself occasionally prior to or during a rain storm. I use Adios Ambros in a small sprayer once month or so to walk around and squirt weeds that I see. It does a pretty good job of keeping the ground ivy from creeping over from my neighbors (chemically treated) lawn. Visit Our Youtube Channel to Find Spring Tip Video - Including Organic Lawn Care Mowing Tips!